As the United States continues to bombard Islamic State militants from the air, US Central Command announced that the military bombed an unmanned drone being operated by the extremist group in Iraq. CENTCOMmade the announcementWednesday, marking the first time the US-led coalition has taken aim at a drone that was being used by the Islamic State (IS, also known as ISIS/ISIL). Eleven airstrikes in total were conducted between March 17 and 18. Details about the drone and the strike are slim, with CENTCOM saying only that the military destroyed a “remotely piloted aircraft and an ISIL vehicle.” The strike occurred near Fallujah, which remains controlled by militants. The drone was a “small, unarmed hand-held type of the sort that can be purchased commercially,” CENTCOM spokesman Maj. Kim Michelsen told the Associated Press. He added that ISIS was using the drone for surveillance purposes and that’s why the US focused its sight on the aircraft. While this drone may not have been armed or capable of flying very high, some are concerned that the group will eventually be able to get its hands on more dangerous technology – particularly if it’s able to steal any drones the US may sell to allies in the region. 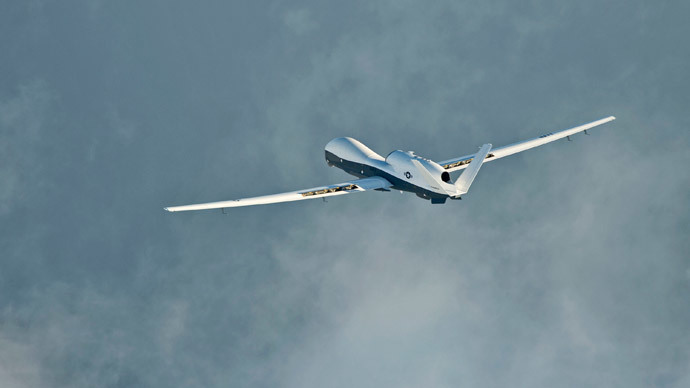 Speaking with the Daily Beast, Christopher Harmer, a senior naval analyst with the Middle East Security Project in Washington, DC, added that even low-tech drones could be fashioned into deadly devices. This is the first drone to be shot down by the US-led coalition in Iraq, but officials believe ISIS has several.